In early 2012, I came across a blog post about two sisters who sent each other one postcard a week for a year. I thought it would be fun to try this postcard project with my sister, who was skeptical at first of our ability to keep it up. My sister and I have different personalities and life aspirations, but we have always been close. I can always count on her. We have lived far apart from each other for many years, but we text, email and talk often, as well as send each other notecards and random care packages. I miss her constantly, so I cherish her friendship. It didn’t require a lot of work or writing. Sometimes we wrote just a simple sentence about our week or something we were looking forward to. It also became an adventure to find more interesting postcards than those with pictures of the towns we live in. Now I have this really fun collection of postcards from my sister from the year 2012. Thank you, MaryKay, for playing along so well! 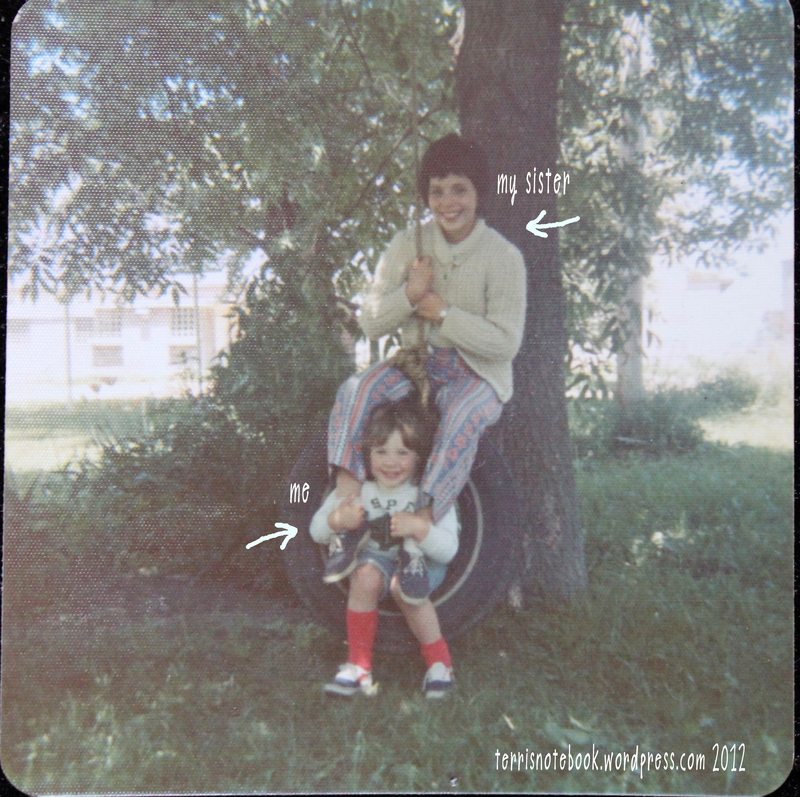 Yes, that’s me (age 3 or 4) sitting in the tire and my sister (age 10-11) sitting on top. One of my favorite pictures of us! What a great idea! It’s so important to keep in touch with family, and friends as well. This gives you something that you can save and share. Are you doing it again this year? Thanks Cheryl. That’s a good question – I’m not sure if we’re doing it again this year. I got a postcard from my sister last week, which was January, so maybe we are. It was so nice to look forward to getting a personal note in the mail each week. That is such a great photo of you and your sister and what a wonderful weekly treat to look forward to. That photo is so cute. I think this is a great idea. I love it! Makes my heart feel full! Oh! How cool that you suggested the idea and your sister so readily agreed. Not only did it force you each to slow down and write little notes to each other but it forced you each to have each other in your thoughts each week for a year. In this hustle and bustle life that we face it warms my heart to know that you both did this for a WHOLE YEAR!!! Bravo! Thanks Dana! It became something we both looked forward to doing and receiving, more and more as the year passed. I hope we continue to do it. So did you ever count how many I actually sent? I’m sure it was nowhere near 52. Sometimes, I would think aboseawater to write and then couldn’t remember if I actually did it or only thought about it! Toward the end, I really ran out of decent postcards. Oh no, I’m not going to count! I’m sure I have at least 52 from you. I think we did pretty good keeping up. I had the same trouble, trying to remember if I actually sent one or just thought about it.